Home Best Products Appliance Best Space Heater for Apartment: Which Product Should You Buy? For a cozier time during fall and winter, you need to invest in a good space heater. However, since your apartment has limited space, you can’t just buy any model that will catch your attention. 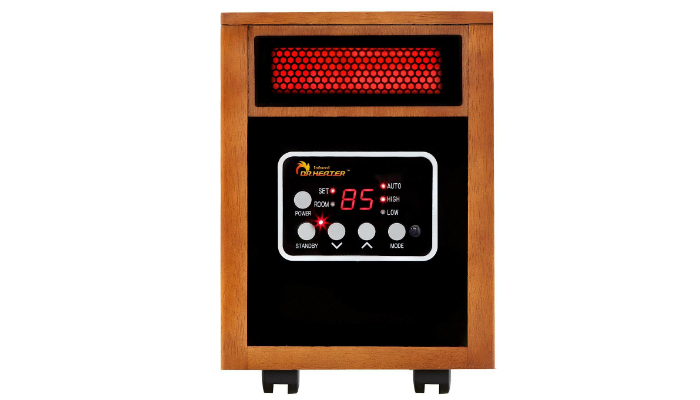 Because we give importance to your household needs, we’re recommending the best space heater for apartment. Why buy an extra-small heater when you can have something that’s just a little bulky but much more powerful? Dr Infrared Portable 1500-Watt Space Heater is so effective that it can heat up your whole apartment. That’s mostly because of its Dual Heating System. Don’t worry about accidental burns; this product has a high-quality cooling system. Its surface, cord and the plug will remain cool to touch no matter how long you use the device. More importantly, the heater itself won’t overheat. In fact, it has a 12-hour automatic shutoff timer in case you’d forget to turn it off. Another potential thing to worry about is when somebody accidentally tips the heater over. Good thing that this product has a sturdy base and an automatic shutoff feature. As a plus, it has caster wheels for mobility. When it comes to convenience, this space heater comes with a remote control. It is also very quiet, thanks to its High-Pressure Low Noise Blower. It has a noise level of only 39 decibels. 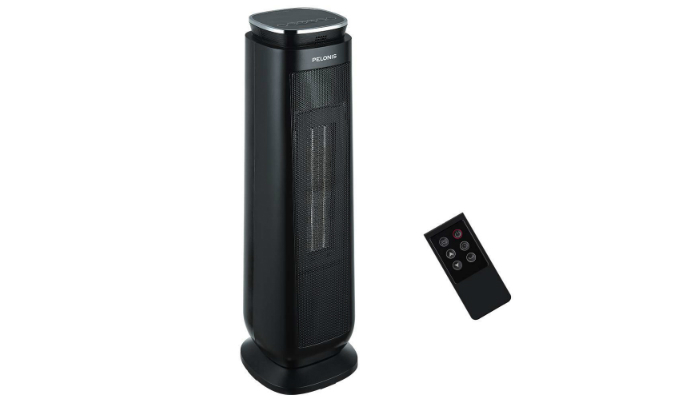 With Lasko 5160 Ceramic Tower Heater, you can save money because of its low energy cost. Its power is already comparable to central heating systems that use a lot of electricity. We should also talk about a common problem owners face when using space heaters. There are actually models that create hot and warm spots in enclosed spaces because of their poor design. Fortunately, with the widespread oscillation of this product, warm air is perfectly distributed all over the area. If you already have a lot of remote controls in your home, you might like the next feature. This space heater comes with a built-in storage for the remote control. That can minimize the clutter on your coffee table. 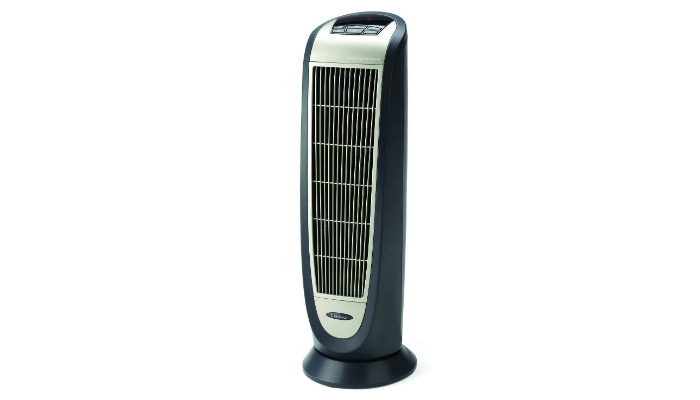 For sudden freezing moments, PELONIS 1500W Ceramic Space Heater is a very reliable appliance. It can heat up a cold room fast with just one click of the remote control. It is best for bedrooms to prevent people from stepping on an ice-cold floor after waking up. Don’t get intimidated by the size of this space heater. It is still lightweight enough to be carried around. In addition, it has a sturdy handle. Also, this product still promotes hassle-free storage. It is so compact that it can fit most closets. 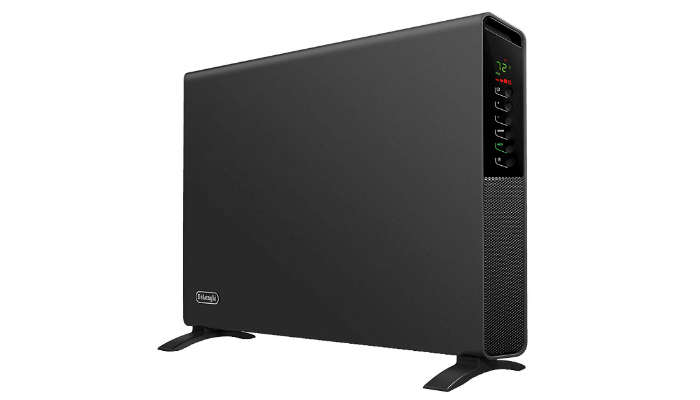 Taking your energy savings to the next level, Honeywell HZ-7300 Deluxe Heater has a unique usage indicator. You can easily estimate the cost of your next electricity bill. As you can see, this product looks a bit smaller than the first models. Some people prefer this size for better portability. Even better, this space heater has a convenient thermostat feature. It will maintain your preferred temperature, turn off based on your settings, and turn back on if it’s cold again. That’s another feature that can definitely lower your energy cost. Looking for something more stylish? 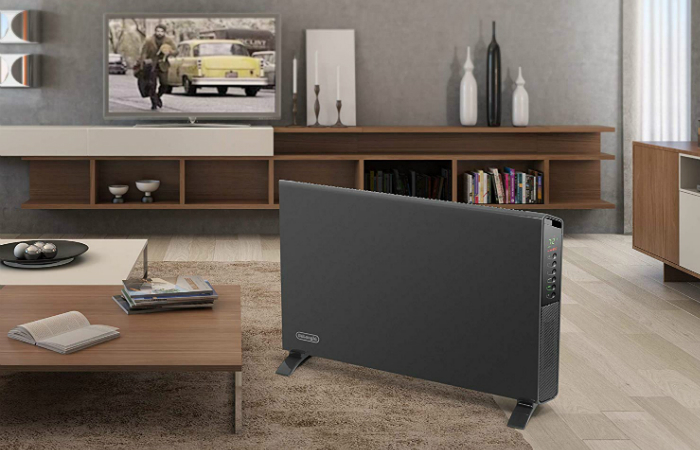 De’Longhi SlimStyle Convection Heater has a nice modern design that will look great in any room. It can even be mounted on a wall to save space. This panel heater is super-lightweight! We’re quite surprised, too. Who would’ve thought that this big appliance is portable? Regarding the controls, they’re located on one side only to avoid disturbing your vision with light indicators. They’re also touch-sensitive for faster adjustments. If you’re thinking about going for a fan-type heater, why not go for something that’s versatile? 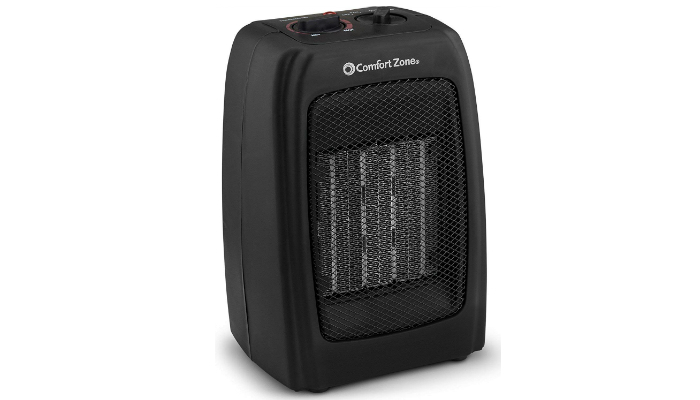 Comfort Zone 166648 Space Heater doesn’t only have a thermostat; it also includes a “Fan Only” setting. 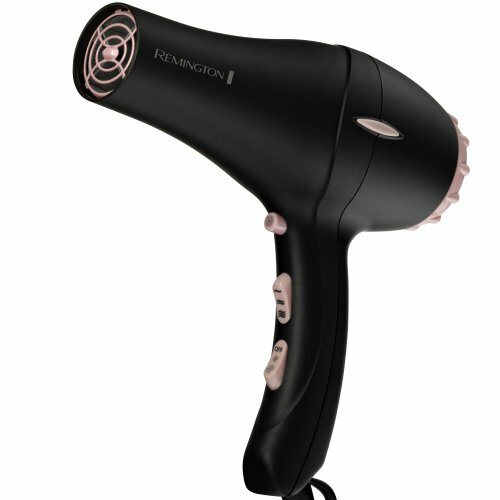 This product may not be as efficient as other options, but it’s less likely to blast heat that can trigger discomfort. It works gradually, which is preferred by a lot of homeowners. We have to admit; this space heater makes a humming noise. However, the consistent sound isn’t exactly annoying. Look at the bright side; it can serve as a white noise machine for people who can’t sleep easily. 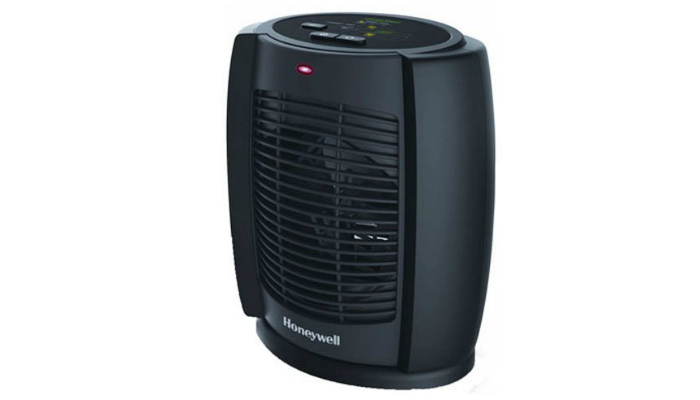 Wattage, safety, and energy saving features make the best space heater for apartment. 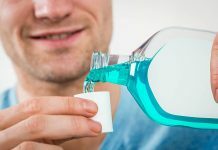 Learn more about these factors! By considering wattage, you’ll be able to ensure if the space heater would heat up your entire apartment. The ideal type for big apartments is the 1,500-watt space heater. This level of power is enough to cover an enclosed space measuring 150 square feet. That’s just an estimate, though. The heating capacity of a space heater is also based on its system and your apartment’s humidity. Of course, we should discuss safety, too. Space heaters can actually cause fires. For starters, the surfaces of the appliance should always be cool to touch. This proves that the device has an advanced system that can regulate heat perfectly. That also leads to a lower probability of fire. Another feature that’s perfect if you have kids and pets at home is the automatic shutoff. It should be triggered by two important factors – overheating and tip-overs. One common reason why space heaters are in-demand is their lower energy cost. Compared to centralized heating systems, they’re much cheaper to use. There are three energy-saving features you should consider. First is the adjustable thermostat. It uses sensitive temperature sensors to know exactly when to turn on and shut down. Timers are essential, too. This is crucial to avoid leaving the appliance unattended the entire time you’re outside. Admit it; you forget stuff sometimes. Not all space heaters include this feature, but having a usage indicator can also help you save money. You’ll easily determine if you’re already using the appliance too much. What if it’s still cold and your energy usage is already too high? You have no choice but to be more resourceful. You should know how to keep your home warm without using technology. Another important thing you should learn is how to layer for winter. Considering its wattage as well as features concerning safety and saving energy, we selected Dr Infrared Portable 1500-Watt Space Heater. With its 1,500 watts of power, it can keep your entire apartment warm. For more products that can make your apartment life easier, check out the best electric grills and tankless water heaters.